I can’t blame marketers for avoiding the development of marketing plans, launch plans or any other version of a strategic plan. This apparently reasonable request usually requires countless hours of writing and revisions, only to be filed away in some dusty online folder. The reason marketing plans don’t get implemented is that they are focused on what you want to achieve. In fact, countless articles and templates for marketing planning suggest that you start with your goals, obstacles, and objectives. While these are certainly critical components, I don’t see how marketers could possibly expect anything built around internal needs could withstand exposure to the pressures of new priorities, ideas and people. What do your buyers want? While marketers often try to include market data and audience profiles in their plans, if you look closely you’ll see the plan says nothing about what your buyers want to know during their journey or where they go for this information. Thus, the actual content of marketing deliverables is left to the imagination of the team that is doing the work. It should be no surprise that depending on where the work originates, the content differs dramatically. Even more costly is the team’s guesswork about how to deliver the content, which has much more to do with your preferences than the buyers’. A more rational and sustainable approach to planning begins with clarity about what affects your buyers’ decisions (and just as critically, what doesn’t matter to your buyer). It might feel like cheating, but what if you knew the buyers’ true story about everything they did, and every question they asked, as they went through their awareness, consideration and decision process? Now your marketing plan could be based on the information buyers are seeking and actual insight into how buyers decide that a competitor’s solution (or the status quo) is better suited to their needs. To illustrate this potential, here is a mock-up of several different buyer’s journeys wrapped up into one. Note that we mixed up the findings from several personas to protect the intellectual property of the companies that invested in this research. So please don’t use this mock-up to guide your own planning, but this will give you a sense of the detail about your buyer’s informational needs that results from the proper research. In this example, we have also combined results from several studies to illustrate the steps a buyer might take during their journey. 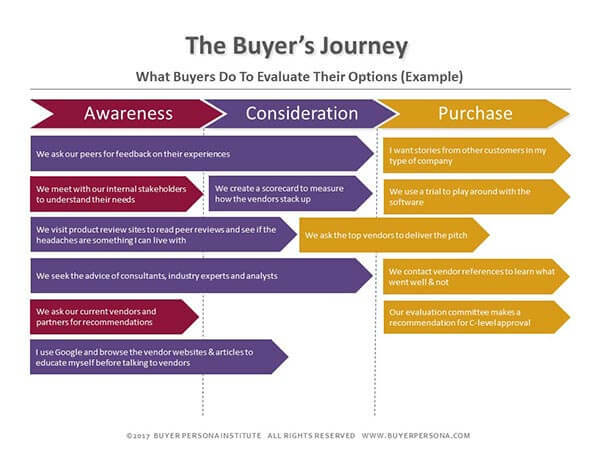 You’ll note that unlike a lot of buyer journey examples you’ll find online, this one is about what the buyers do, not your marketing activities. Once you know where buyers go for trusted information and who influences their decisions, you’ll have the data you need to decide which marketing spend is most valuable and what deserves less attention. Many marketers who wish they had deep buyer insights say it is difficult to justify the investment. If this is you, consider the very tangible costs of making stuff up as you go and failing to give buyers the useful information they are seeking during their journey. You’ll discover quite quickly, the costs are enormous for you, your sales team and your company’s bottom line. 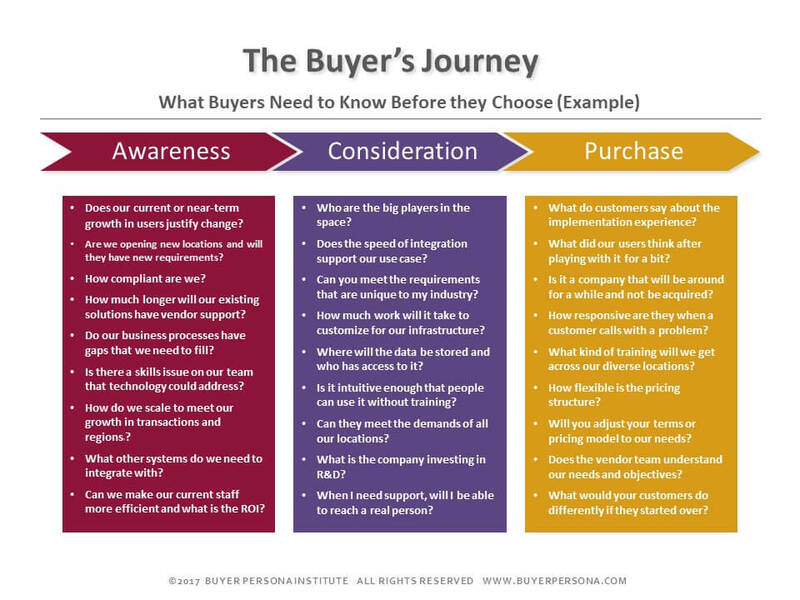 For more recommendations, attend our virtual Buyer Persona Masterclass or read our book; Buyer Personas: How to Gain Insight into Your Customer’s Expectations, Align your Marketing Strategies and Win More Business (Wiley). If you are even more passionate on the subject, contact the Buyer Persona Institute directly so we can learn about your special circumstances and tell you how other marketers have solved the same challenges.